Don't miss our Second Anniversary Celebration this Friday, June 6th from 5-8pm. We are celebrating this special time with the opening of our June exhibit "On the Verge." We are in the process of installing the exhibit this week and can't wait to reveal new work by photographer Robert Asman and sculptor Leonid Siveriver. 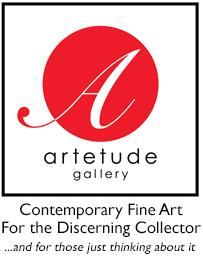 Both artist's bring a unique, cutting edge to the gallery. There will be a champagne toast and refreshments!